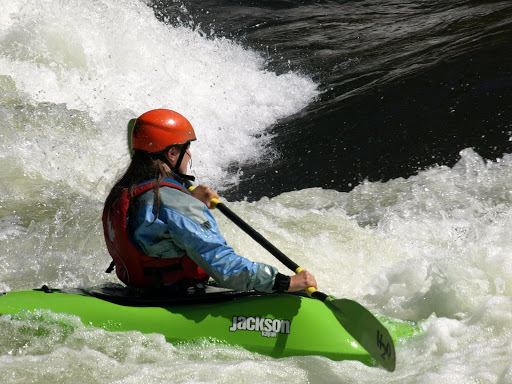 The Upper Gauley is unlike any river I have ever kayaked on. It is big, fast, pushy and steep. Most of the major rapids have specific make-or-break lines. I paddled the Upper last year twice, both times scared to death all the way down. This year, I paddled the Upper 4 times in a Pyranha Ammo, and decided today to give it a try in my playboat. Playboating the Upper Gauley would definately be a step up for me. Jeremy also decided that I was going to remember the lines and lead through every rapid. The lines don’t change in a playboat, but you have to muscle your way through each rapid a bit more than in a creekboat or river runner. All in all, things went well. My lines were a little off; I found the hole in Insignificant, I busted my knuckles hitting VW Rock through Pillow, had a good line all down Lost Paddle, and a fine line through Iron Ring even though it was upside down half of the way. It’s one thing to follow someone else’s lines, but a completely other thing to pick them out yourself. I was pretty proud that I remembered the lines down the rapids. I can’t wait until Friday to do it again! I also brought my brand new camera with me on this run and got some playboating shots. At Hungry Mother, I pulled a pretty big loop, but Jeremy was helping someone with their backband and didn’t get it on film. I’ll have to go back and do it again on Friday. Did you hit up the Lower Gauley at all?? A rediculous amount of play is on that stretch!